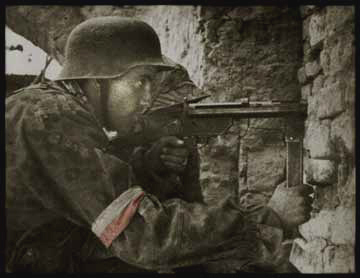 The Warsaw Uprising of 1944 — a heroic and tragic 63-day struggle to liberate World War 2 Warsaw from Nazi/German occupation. Undertaken by the Home Army (Armia Krajowa, AK), the Polish resistance movement, at the time Allied troops were breaking through the Normandy defenses and the Red Army was standing at the line of the Vistula River. Warsaw could have been one of the first European capitals liberated; however, various military and political miscalculations, as well as global politics — played among Joseph Stalin, Winston Churchill and Franklin D. Roosevelt (FDR) — turned the dice against it. This site is dedicated to all those who fought for their freedom in the Warsaw Uprising of 1944 as well as all those who, as civilians, perished in the effort. © Copyright 2016 Project InPosterum. All rights reserved.